Winter is the perfect time to encourage some natural weight loss so that those who finished the summer on the plump side can slim down for spring, when the grass starts to grow again. One of the easiest steps to take is to either not put a rug on an overweight horse or to use only the lightest one possible. The horse will then have to burn their stored fat to keep warm. As hay or haylage is the main source of fibre through the winter, it is also the main source of calories for the good-doer, so may need restricting in order to control calorie intake and encourage weight loss. 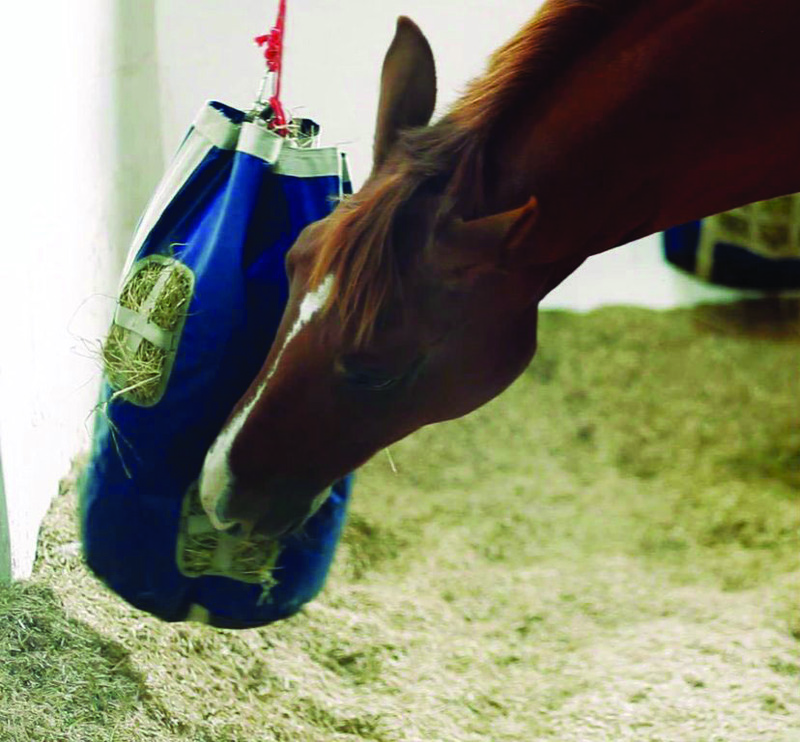 Feed 1.5% of the horse’s bodyweight in forage and other fibre sources. This is 7.5kg per day, for a 500kg horse. If your winter grazing is plentiful, and your horse turned out 24/7, additional forage may not be necessary. Soaking hay for up to 12 hours will wash out potentially fattening water-soluble carbohydrates (sugars), leaving the fibre to satisfy the horse’s appetite. Weigh out your horse’s daily forage ration and divide it into as many small ‘feeds’ as possible. Also, use small-holed nets, double netting and/or other ‘feeding extenders’, like HayGrazers, to make a small amount last longer. The aim being to maximise chew time so the horse is not without something to eat/chew for lengthy periods. Choose stalky, late cut hay or haylage, where possible, as this will be less nutritious and less digestible than soft, leafy forages. Rather than a token amount of a low energy mix or cube, along with molassed chaff, feed the recommended amount of a balancer, like Baileys Lo-Cal. This will supply essential nutrients (protein, vitamins and minerals), likely to be lacking in forage, especially when it’s been soaked, but without the calories of a traditional mix or cube. Lower calorie fibre sources, which can be fed with a balancer, or as a partial alternative to forage, include low calorie unmolassed chaffs and soaked unmolassed beet pulp eg. Speedi-Beet. (1 Baileys measuring mug of dry Speedi-Beet, soaked with 5 mugs of water, makes half a bucket of beet with fewer calories than a Stubbs scoop of Baileys Light Chaff). Avoid allowing the laminitis-prone access to grass on a bright sunny morning as, even in winter, the sunshine can cause the grass to produce sugar, which is stored as fructans, and an excessive intake of fructans can cause laminitis. Body Condition Score (BCS) your horse, and weigh or weightape him, at the beginning of winter, then repeat this regularly to monitor progress. Exercise your horse or pony as much as possible. Weather conditions and daylight can be restrictive, in the winter, but even daily hand walking or light lunging are better than nothing. A fully balanced diet will help the overweight horse feel more able to exercise and encourage weight loss. Visit the Baileys web site for more tips and advice on feeding the good-doer or laminitis-prone or, click here for a copy of their Equine Weight Loss Programme workbook, to help you plot your horse’s progress.